II diavofo no e diavola per essere diavolo, e diavolo perche e vecchio. Today's Political Picture is reminiscent of the death scene in Zorba, The Greek. In the movie Zorba's wife is dying, her friends and neighbors drop in to take her meager belongings on the pretext of "visiting" her, while Zorba attempts to comfort her in her final seconds of life. Our economy may not be dying, but it is seriously ill, yet everybody and his or her special interest is trying to capitalize on the bailouts. Including New Mexico. For instance: If Albuquerque is in financial striates, it's because Mayor Marty and the Municipal Mafia fell for The Texan's BS. Time and time again they went out and did things on Bush's promise, complaining about unfounded demands from upstairs but digging us deeper in the hole on the promise that the check was in the mail. "No Child Left behind" promised so much. Where is it? How about the money for all the cameras, and a host of too many other things to list here but are well known to all of you. It would seem that anyone smart enough to win political campaigns would be smart enough to see through a scam after falling for it as many times as this gang has, but all Bush had to do was to promise and they believed it and spent it before they got it to live beyond their means, all the while they were telling the people that there was a war going on and that they should tighten up their belts. The people did that, but they went on spending like a bunch of power-drunk republicans. Surely we can do without things, such trolleys until we dig ourselves out of this financial mess, or do you anticipate a more complete melt-down of Wall-Street and want to ride in style when we all go to the poor-house? The exploitation of government, religion, and race for monetary, political, or social personal benefit is rapidly becoming a thing of the past, like the old time filling stations, the field became too overcrowded for small timers to keep up with the competition. More and more only the fittest of the fit survive, and fittest are playing for Billions, while small-fry are selling their souls for a few hundred thousand and even less in many cases. The financial crisis is much worst than what the public is being told, and it's going to stay that way for a lot longer than any of the other financial messes to which greed always leads. Omnipotent Kaffe Klutch Klique KaLLers to Konservative radio Koncure that the bank regulator fell asleep at the wheel, and didn't enforce the regulations. WHAT REGULATIONS! During the Great Depression of 1929, FDR enacted a series of laws called "The Depression Laws, " to insure that it would never happen again. Ronald Regan, in his wisdom, tossed all those laws out, doing away with our safety nets. Today the very same entities that inspired Regan to trash them and cheered him on when he did are lamenting what we, who went though it once knew was inevitable if banks were not subject to "regul atuib," Many depression busters were utilized to stave the wolf from our doors in the 1930's, most of those methods have been outlawed , privatized, politicized, or otherwise rendered ineffective since then, and some fell due to legitimate progress. Let's go back and review some of these things and you decide if doing away with them was justified or not. First of ail, you have to picture Albuquerque as it was then., not as it is now. New Mexico had just become a full-fledged status in 1912, but already, the joy and enthusiasm that went with the new status had already suffered it's first major disappointment when the bottom fell out of the market in 1929. Old Town had been the center of social, commercial, and political; activities, not to mention the religious aspects of the community until the railroad came, after that Old Town had been abandoned and, except for the church, Charley Mann's general store, the post office and one little cafe, a home for unwed mothers it remained a neglected ghost town that was not long in deteriorating. The proper name for Old Town then was Old Albuquerque, and it's limits were from what is now Mountain Road, to about what is now Central Avenue, and from where the roads now split to form Old Town Road and Mountain Road, to the East side of what you now know as Rio Grande Blvd. 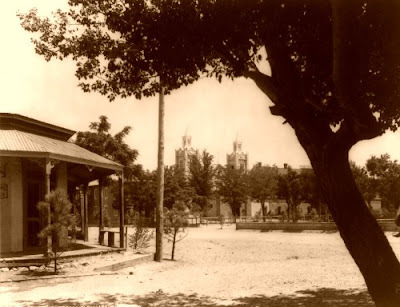 What had been the Territorial Fair became The Society Hall, a dance hall that drew people from everywhere within what you now know as Albuquerque but then identified themselves as independent villages, Atrisco, Barelas, Armijo, Los Tomases, Duranes, Los Griegos, Corrales, Alameda, Martineztown, etc.